Purrrr, purrr, purrrr! 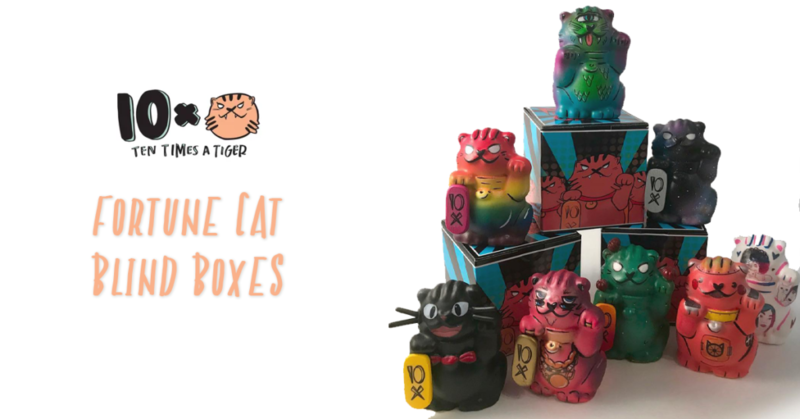 The Fortune Cats are back by Ten Times a Tiger in the form of a new blind box series. Inspired from the Ten Times a Tiger logo and the classic Maneki Neko design come mini fortune cats! The Fortune Cats are now available on pre-order (due to ship May 1st), standing at 3inches tall, they come in eight different colourways. There is Jiji Cat from Kiki’s delivery service, Rainbow Tiger, Galaxy Tiger, Cute Cat Ladies, Cat-Bot, Orion Tiger, Cactus-Cat, and Wild Thing! Priced at a very reasonable $15 (about £11). You can purchase your Fortune Cat from the Ten Times a Tiger online store HERE. If you order 3 or more use code: GOODFORTUNE for FREE shipping! Ten Times a Tiger can be located on your Instagram HERE.